Where do I go with my complaints and ideas to the improvements? Ingenium Golf, who are behind the GLFR app, very much would like your feedback and want to use it as much as possible in developing the product further. If you have any good or bad criticism, advice or maybe ideas for improvements, please let them know at [email protected] Not everyone will receive a personal respond and not all of your ideas ideas/wishes will be fulfilled, but your mails will be read and the content will be used for evaluation. All players will be kept up to date on what aspects of GLFR app are under development and on the drawing board. How much power does the app require? Not much. If you run it offline, almost nothing, and if you are online there should still be plenty of power on a well-functioning smartphone. Maybe it is a good idea to test both phone and GLFR in advance so you know more. What do I do, if my phone runs out of battery? If you begin your round with a fully charged phone, this should not be a problem. But it might be a good idea to have a power bank as a backup. Again, please test both phone and app – in both offline and online mode to see how much battery is required. How much space does the course guide take up on my phone? Not much. Between 6 and 10MB. How much is the deviation on my GPS? On a normal phone deviation is 1-4 meters depending on local conditions. The new GPS’ that are currently being developed is down to 30 centimeters. On a 275 meter drive 1-4 meters is not a lot, and shots to the green, you also have you laser to double check. What do I do, when it rains and my phone gets wet? You try to keep it dry, just as your paper version the other years. If the weather is terrible maybe keep it in a thin plastic bag, which you picked up at the check in at the airport last time you were in Spain. What do I do, if I don’t have a smart phone? Then you decide if you want to use the GLFR app. And if you do, you buy a smart phone. Just the same, as when the lasers were introduced. Isn’t it expensive with all the data? The GLFR app can be downloaded in advance and run offline. So you do not have to use any data on your round. However, there will be updates between each round, so find some WIFI in the evening and make sure you always have an updated version. How much is the GLFR App? 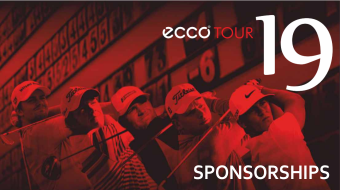 The GLFR app is free of charge for all ECCO Tour events. Can I help my playing partners with distances and measurements? Yes you can. You can do that with both GLFR app and lasers. Especially on a par-3 that might be a time-saving solution. Where do I write my personal notes, that I normally write in the paper version? From the beginning of the season it will not be possible to take notes in the GLFR app. It is one the features that is currently being developed, and hopefully it will be ready during this season. For now, a solution could be “notes” on your phone, or it could be a piece of paper that you stick to the back of your phone or to your laser. Can I use the scorecard in the GLFR App? Yes you can, but you shouldn’t. You are still filling out a paper version of your scorecard, so no need to keep score in the app at this point. What happens to my measurements, when we are moved to a different teebox? If we use a different teebox than the backtee, all measurements will change. The GPS is in your phone, so it’s easy to look in your GLFR app, when you are on the correct teebox, and you will se exactly how far you have to any point on the fairway, green etc. Can I still use my laser / range finder? Yes, lasers / range finders will still be permitted on the ECCO Tour in 2018. Will measurements be to the flag or to the “T”? All measurements will be shown to the “T”. Today’s flag/pin will be shown on the green, but measurements will be shown to the “T”. The grid shown on the green will give you measurements of the entire green, while today’s pin sheets (shown on each hole in the course guide) also indicates where the pin is. Like all the other years, you do the math. How do I know I have the newest and updated version? You can update your version in more than one way. Usually, GLFR will automatically handle the update when you start the guide. Simply click the green button with the play icon to start the guide and the updated guide will download. If the download did not start, and you expected a new version to be available, you can manually force a check. On the guide’s page, where the play button is, drag down from the top to force a sync and then click play. If there was anything new on the server, it will be downloaded. Each day the pin positions are updated. To make sure that you have the correct version, you can also check that the pin sheets are updated in you course guide. Why this sudden change away from printed course guides? There are many reasons for moving in an electronic and digital direction. Some of the clubs are not big fans of the spray required for a traditional course guide. Printing will be limited. In 2017 we had around 2.000 prints pr. Tournament and used around 24 spray paints. That is not good for the environment either. Quicker to fix a problem/error to perfection. The potential is enormous. The prospect of being able to track each player’s shot via live scoring is appealing, and so is the idea of automatically generating statistics. By collaborating with GLFR we believe that we can speed up the process of generating an even better app, and therefore there is also an element of “working progress” in 2018. The world is moving towards digitalisation, and we feel that it’s better to be first than last in adapting to the world we live in.